Elaine’s journey on earth ended very peacefully on Saturday, April 4, 2015, with her family supporting her through her final steps. Mourning her loss is her beloved husband John of almost 68 years. Elaine was born in Edmonton and raised in the Oliver neighborhood. After graduating from Strathcona High school, she joined the RCAF Woman’s division and at the end of the war she met the love of her life – John. Elaine’s memory will be deeply cherished by John and their four children, James (Susan), John (Cheryl), Janice (Les) and June (Lori). Elaine was very proud of her grandchildren, Karina (Kam), Nicole (Ryan), Jack (Kelly), Rebecca (JL), Sheila (Jeff), Benjamin (Alyssa) and Matthew. She also has 11 Great-Grandchildren. Elaine and John enjoyed Scottish Country dancing and met many wonderful life-long friends having had many great times together. Elaine loved having family gatherings at the cabin at Pigeon Lake and enjoyed travelling. 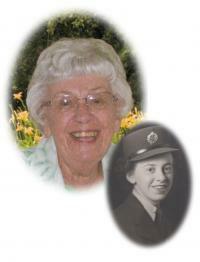 A Memorial Service celebrating her life will be held on April 11, 2015 at St. Peters Anglican Church 11035 – 127 Street, Edmonton at 11:00 a.m. If friends or family so desire, memorial donations can be made to Salvation Army, Edmonton Humane Society, Heart & Stroke or Canadian Cancer Society.